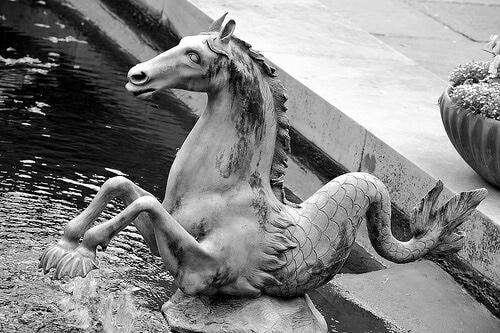 It is not the seahorse (hippocampus) that sparked my imagination, but real horses (equus) splashing through the water. For some reason it is connected with words as: freedom, pure joy and for some romance. The natural image of a horse would be on land because it has four legs and no special flippers. It’s an earthbound and grounded animal. A domesticated horse is bridled and girthed -the connection with freedom is made if you loosen the reines. But the horses in fountains or the waterfront often show the untamed , free-roaming version preferably a wild horse (equus ferus ferus). This link with authentic or primitive drivers spark the more emotional connotations. And apparently water is needed to support the image. It might be the combination of gentle and brutal which applies to both water and horses. The wonder that something can be heavy and fluid. Help or destroy us. Carry or overthrow you. 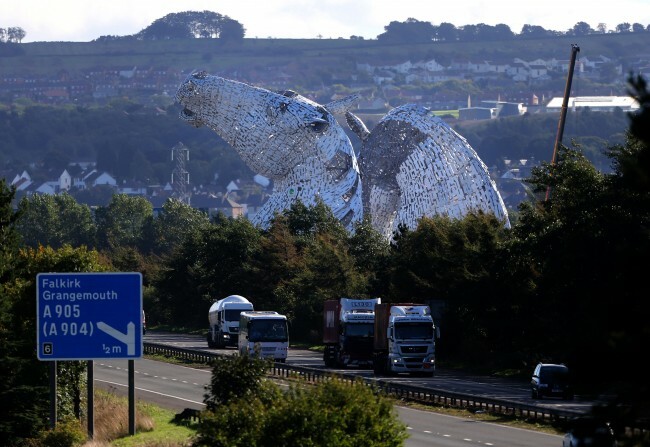 wild becomes furious when the connection with horse powered heritage is made, like the 30 metres tall Kelpies in Falkirk, Scotland. Or it might be that because we are bored watching art in contained spaces that we look for new experiences moving art to the shore. This new environment evokes the free spirit of the horses. Like Gromly’s english men at the Liverpool shore. And take it even one step further: in the sea. 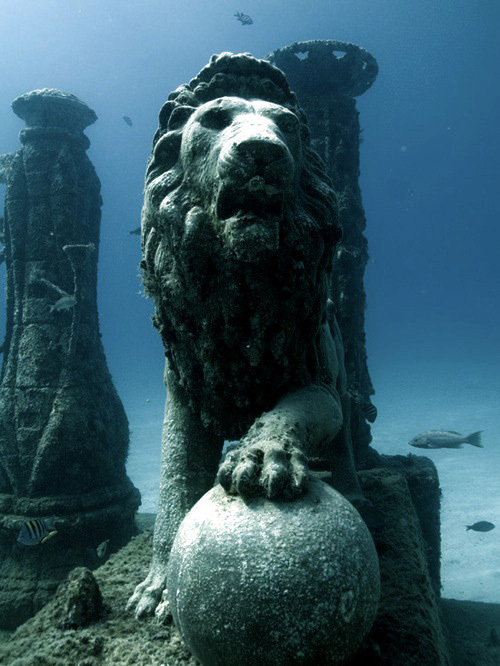 A new trend (Mexico, Granada) seems popping up: underwater statue-gardens. It makes a nice combination with adaptive art since the water will change the surface and texture of the sculptures and the environment in which the sculptures are presented enfold a variety of colours and shades, more than is possible in the above-world. It transforms even the most dominant symbols to tranquil gatekeepers. Adaptive art? That term is coined by the people faced with physical or cognitive change that have to adapt their method for creative expression. So i guess i meant to say: contextual art. Since the traditional elements of art: line, shape, form, space, texture, value and color also incorporate the context, experiments with these are made. 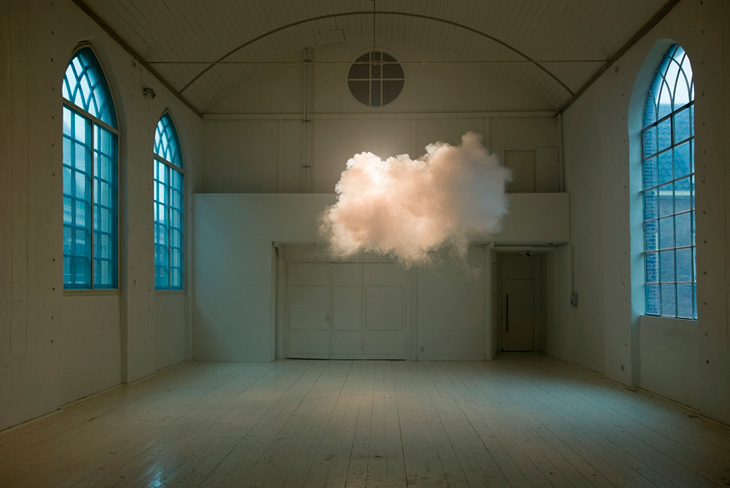 Artist had discovered this element already in the last century in combination with conceptual art, where the art becomes an act that can only be experienced on the moment itself. Commercial research practice only recently (re)discovered the impact of the momental and situational factor. The importance of being there at the right moment lures the exclusiveness of something. Preferably the timeline of the interplay is not exactly known therefore stretching the moment and spicing the tension for the big event, creating a bigger resonance and inevitable relief when the WOW-factor is there. BJ Fogg (persuasive design) and AL Barabasi (situational network design) use context as an enabler to create an opportunity to influence behavior. I personally like Barabasi’s term ‘granular media‘ referring to the property that granular materials (like sand or social communities) conform to the shape of a container and will flow when pressured. And that is my cue back to the water and the horses: when pressured they build up uncontrollable power. And that is an image we have been trained to detect immediately because it even helped our ancestors to survive and given water and horses a bigger meaning than their physical being. Magic of Horses‘ (2011) by British-born sculptor Susan Leyland. Still Water at Marble arch London by Nic Feddian Green. Driftwood Horses by Heather Jansch. “Stick-to-it-ive-ness” by Richard Morse. Quote: “The visual representation of horses running on the river’s surface, symbolize the struggles and perseverance, the simple grace yet powerful attitude that everybody needs in difficult situations.” And this needly summarized this post also because Richard Moss is not a copycat but an adaptive artisan. Love this — thanks! I wrote a my piece on my Soul Horse Ride blog, entitled: My Horse is a River. I work with horses in California and Hawaii. The Hawaiians are known to have ‘started’ riding (‘backing’) their young horses in the sea — which makes sense, as it’s perhaps a safer way to accomplish the task. It’s an amazing experience to ride into the sea on a horse. Some horses blow air from their noses, making a loud pulsing noise. 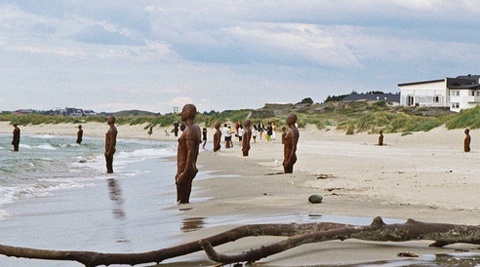 They surge up and down, striking off from the bottom sand until they can no longer touch. Then they stretch out their neck and swim, at which time your body lifts off the back of the horse because of the buoyancy of the water. Usually the horse then returns towards the shore. If you still have hold of the mane, you may be able to put a leg over and climb back on. Otherwise, the hose leaves you in the drink.